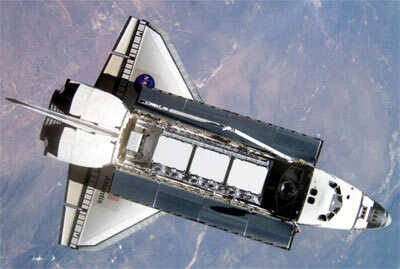 The Space Shuttle is the world's first reusable spacecraft, and the first spacecraft in history that can carry large satellites both to and from orbit. 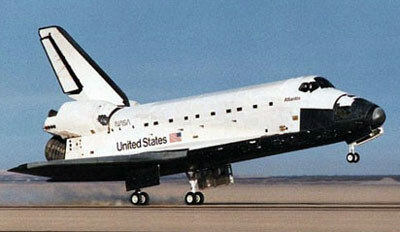 The Shuttle launches like a rocket, maneuvers in Earth orbit like a spacecraft and lands like an airplane. Each of the five Space Shuttle orbiters built -- Columbia, Challenger, Discovery, Atlantis and Endeavour -- was designed to fly at least 100 missions. The Orbiter is the centerpiece of the Space Transportation System (STS). About the same size and weight as a DC-9 aircraft, the Orbiter contains the pressurized crew compartment (which can carry up to eight crew members), the huge cargo bay, and the three main engines mounted on its aft end. The cockpit, living quarters and experiment operator's station are located in the forward fuselage of the Orbiter vehicle. Payloads are carried in the mid-fuselage payload bay, and the Orbiter's main engines and maneuvering thrusters are located in the aft fuselage. The cockpit, living quarters and experiment operator's station are located in the forward fuselage. This area houses the pressurized crew module and provides support for the nose section, the nose gear and the nose gear wheel well and doors. The 65.8-cubic-meter crew station module is a three-section pressurized working, living and stowage compartment in the forward portion of the Orbiter. It consists of the flight deck, the middeck/equipment bay and an airlock. Outside the aft bulkhead of the crew module in the payload bay, a docking module and a transfer tunnel with an adapter can be fitted to allow crew and equipment transfer for docking, Spacelab and extravehicular operations. The two-level crew module has a forward flight deck with the commander's seat positioned on the left and the pilot's seat on the right. The flight deck is designed in the usual pilot/copilot arrangement, which permits the vehicle to be piloted from either seat and permits one-man emergency return. Each seat has manual flight controls, including rotation and translation hand controllers, rudder pedals and speed-brake controllers. The flight deck seats four. The on-orbit displays and controls are at the aft end of the flight deck/crew compartment. The displays and controls on the left are for operating the Orbiter, and those on the right are for operating and handling the payloads. More than 2,020 separate displays and controls are located on the flight deck. Six pressure windshields, two overhead windows and two rear-viewing payload bay windows are located in the upper flight deck of the crew module, and a window is located in the crew entrance/exit hatch located in the midsection, or deck, of the crew module. The middeck contains provisions and stowage facilities for four crew sleep stations. Stowage for the lithium hydroxide canisters and other gear, the waste management system, the personal hygiene station and the work/dining table is also provided in the middeck. The nominal maximum crew size is seven. The middeck can be reconfigured by adding three rescue seats in place of the modular stowage and sleeping provisions. The seating capacity will then accommodate the rescue flight crew of three and a maximum rescued crew of seven. The airlock provides access for spacewalks, known as extravehicular activity, or EVA. It can be located in one of several places: inside the Orbiter crew module in the middeck area mounted to the aft bulkhead, outside the cabin also mounted to the bulkhead or on top of a tunnel adapter that can connect the pressurized Spacehab module with the Orbiter cabin. A docking module can also serve as an EVA airlock. The airlock contains two spacesuits, expendables for two six-hour payload EVAs and one contingency or emergency EVA, and mobility aids such as handrails to enable the crew to perform a variety of tasks. The airlock allows two crewmen room for changing spacesuits. In addition to forming the payload bay of the Orbiter, the midfuselage supports the payload bay doors, hinges and tiedown fittings, the forward wing glove and various Orbiter system components. Each payload bay door supports four radiator panels. When the doors are opened, the tilting radiators are unlatched and moved to the proper position. This allows heat radiation from both sides of the panels, whereas the four aft radiator panels radiate from the upper side only. Some payloads may not be attached directly to the Orbiter but to payload carriers that are attached to the Orbiter. The inertial upper stage, pressurized modules or any specialized cradle for holding a payload are typical carriers. The Remote Manipulator System, or RMS, is a 15.2-meter long articulating arm remotely controlled from the flight deck of the Orbiter. The elbow and wrist movements permit payloads to be grappled for deployment out of the payload bay or retrieved and secured for return to Earth. A television camera and lights near the outer end of the arm permit the operator to see on television monitors what his hands are doing. In addition, three floodlights are located along each side of the payload bay. The aft fuselage consists of the left and right orbital maneuvering systems, Space Shuttle main engines, body flap, vertical tail and Orbiter/external tank rear attachments. The forward bulkhead closes off the aft fuselage from the midfuselage. The upper portion of the bulkhead attaches to the vertical tail. The internal thrust structure supports the three Space Shuttle main engines, low pressure turbopumps and propellant lines. To see the crew lists of the missions, go to the mission listing.